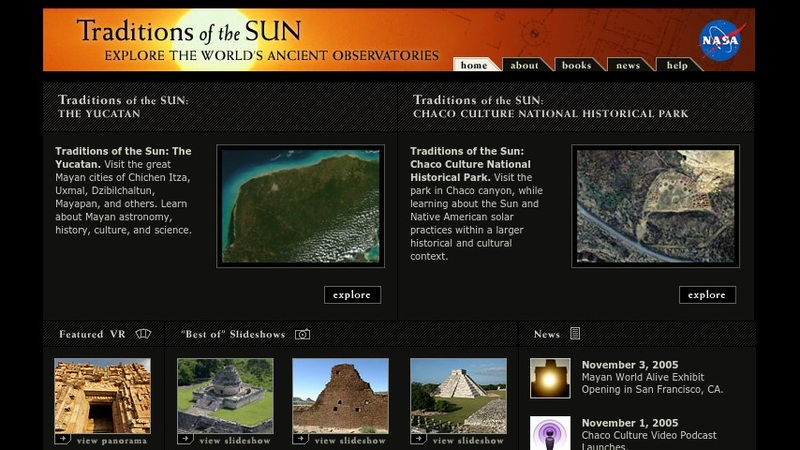 This online exhibit allows visitors to explore traditions of solar observation and ancient astronomy practiced by the Chaco and Mayan cultures of the New World. There is a brief discussion on the development of solar observation and astronomy by early agricultural communities, and slide presentations of sites in the Chaco Culture National Historical Park and the Mayan cities of Chichen Itza, Uxmal, Dzibilchaltun, Mayapan, and others. Visitors will learn about the Sun and Native American solar practices within a larger historical and cultural context, and about Mayan astronomy, history, culture, and science.